After three years of hard work, a Bangor University student will receive a first class honors degree this week. The former Ysgol Eifionydd and Coleg Meirion-Dwyfor student, Caryl Burke, 23, of Porthmadog graduated with a BA Media Studies degree this week. Extremely pleased that the last three years have paid off, Caryl said: "I originally came to Bangor to study primary education, but after I finished the second year, I realised that I was not enjoying the course as much as I had hoped, so I decided to change course and start again. It was a difficult choice and an uncertain time, but looking back, it was definitely the right decision as it has led to so many interesting experiences. "During the last few months I took part in an S4C comedy series in Caernarfon. The work itself was fun and a great experience, but I found it difficult to balance university work with the filming. It was challenging to try and edit my film for my dissertation between scenes, learning lines between essay writing and submitting my dissertation during a lunch break dressed as my character, a 17 year old school girl! "Some of my tutors persuaded me to attend auditions that were being held at the University for an S4C comedy series called ‘FM’; I landed the role of 'Betsan'. As ‘FM' was a comedy series for children, I had a lot of fun and it was a great opportunity to learn more about the industry. I've also worked for BBC Radio Cymru through the University; which again was a good opportunity to learn more about other aspects of the media and get to know individuals within the field. Through the 'Theatre' module I got a chance to work with Cwmni’r Frân Wen. I was one of four who wrote a piece for the stage led by Aled Jones Williams. Later, the piece was performed by professional actors. "I managed the University's radio station, StormFM, during my third year and had the opportunity to present various shows, attend festivals and interviewed Cerys Matthews. 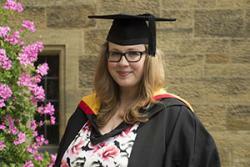 "The highlight of my three years at Bangor is receiving my degree. I also enjoyed the presentations and master classes that were offered in the School, such as from individuals from industry, alumni and Lord David Puttnam. "The biggest obstacle I faced was starting something completely new, two years later than everyone else. But once the work started, I enjoyed learning about the history of the media and many new skills. "In the future, I hope to get a job in television production, editing or writing. That said, I've enjoyed the radio modules, particularly the presenting side, so who knows ..."